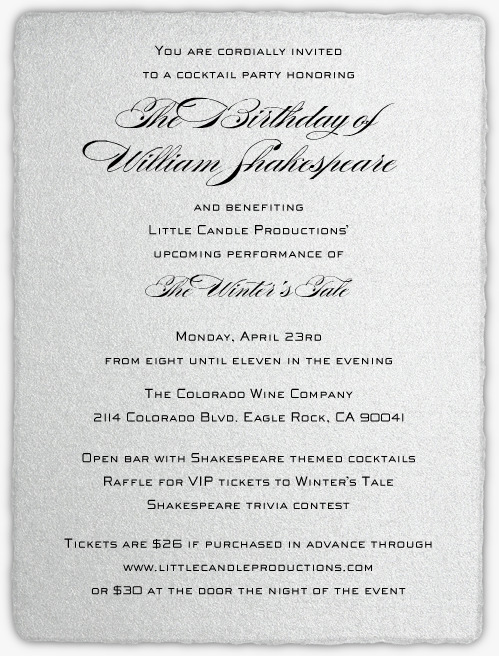 I am very happy to report that one of our crew, Jennifer Bronstein, in partnership with two other women, has co-founded a new theater group called, “Little Candle Productions.” They are having a fundraising event on the 23rd of April and I encourage any of you that are able, to come out and support this beginning. I will be in attendance and hope to see you there. I will always do my best to support the development of theater in Los Angeles. The information is below. Here is a “Ted Talks” that was sent to me by one of the crew, Camila Greenberg. She had wanted me to see it based on some of the session work that we have been doing together. She found Dr. Brene Brown shared a number of insights that were reflective if not down right similar. I believe that many of you might have a similar experience. I found it very valuable.